Passing Daisies: Shabby Apple Giveaway! I'm a huge sucker for anything vintage. So when Shabby Apple contacted me about doing a giveaway, I was really excited! I had seen their website just a few days before they contacted me, so I already knew I liked their products. Shabby Apple is an online vintage clothing and accessory store that was created by women, for women. A percentage of their sales is donated to charitable causes regarding women and children. 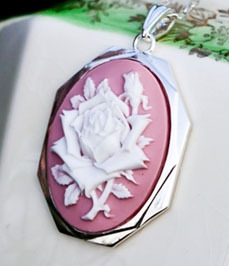 Their products are gorgeous - just like this Queen's Rose necklace that they will be giving away to one of my lucky readers!! 4. Go to their website and tell me about your favorite item! This giveaway is open to U.S. readers only. Sorry! The giveaway will end on Sunday, December 11th at 12AM EST. The winner will be announced the next day. I follow the shabby apple blog. I wanted to add how extraordinary that necklace is. I'm following Shabby Apple on facebook! I'm following Passing Daisies on facebook! my favorite one their site is the fitzgerald dress. i subscribe by email 3.
i really like the chickaree dress and lost in wonderland necklace! i can't choose! but i do just LOVE necklaces with roses on them! my great-grandmother's name was rose (she is deceased) so anything with roses steal my heart! I like Shabby Apple and you on Facebook! Thanks for the great giveaway, what a pretty necklace! My favorite item is their Black Oak dress, it's so simple and cute, and I would wear it everywhere. I love the gondola and spanish steps dresses, along with everything else! I follow Shabby Apple's blog! I love the La Seine dress! Unus Sed Leona likes both Shabby Apple and your blog on Facebook!